After winning our award for best musical (youth company) last year, I was delighted to be invited to the dress rehearsal of Splinters Theatre Group’s production of Copacabana. Featuring original songs by Barry Manilow, Copacabana is a tale of love and romance on the way to stardom in a Broadway style musical fantasy, which promises dazzling costumes, spectacular sets and sensational choreography in an evening of entertainment that will leave audiences breathless. From the first scene where the talented ensemble behind the screen gave an insight into the workings and frustrations of the modern day songwriter Stephen’s head and his frustrations of trying to get the lyrics right to his new song Copacabana, which the audience will have to resist singing the correct lyrics; to the climax that will surprise you in the way any good musical ending should, including a perfect stage kiss and unexpected final twist; the show and it’s musical numbers offered something for everybody from the fabulous big dance numbers of “Dancing’ Fool” to the beautifully love songs of “Who Needs to Dream” and “This Can’t Be Real” and the most Barry Manilow style number of the night “Sweet Heaven”, before the encore musical number that the entire audience will have been waiting for. Featuring some of the best choreography and dancing I can remember seeing on a Sheffield stage, that the likes of Gene Kelly would have been proud of, Copacabana glamorously combines everything you want from a timeless musical, with stunning dancing and vocals from all of the cast and ensemble and stylish costumes that transformed the audience back to glamour of the late 1940s. Fans of Barry Manilow will leave the theatre loving him even more whilst Manilow cynics will leave with new found respect and appreciation for his work. Adam Walker as both modern day song writer Stephen and 1940s singer-songwriter Tony Forte, further proved why we awarded him best actor in a musical last year, firmly cementing himself as a star of musical theatre, possessing the perfect combination of superb singing, dancing and acting ability and stage presence, wonderfully capturing all aspects of his role from the frustrations of being a song writer to the chemistry of falling in love and everything in between, making him one who no one should miss when you see his name on a show’s cast list, before he gets snapped up by a West End production, and who you long to fall in love with you too. Opposite Adam, Emily Wilson beautifully captured the innocent, eagerness, talent and love of Lola La Mar as well as natural chemistry and spark with Adam, with her performance of “Man Wanted” in the Copacabana club proving to be the ultimate transformation number, providing a stunning showcase for her voice and stage presence, with her only getting stronger and more powerful as the song went on. Other stand-out performances included Rachel Wadsworth as Gladys Murphy who brilliantly combined attitude, confidence and likeability that made you immediately wish she was your best friend and always on your side, at her very best, with her charisma, stage presence and talent shining through in “Copa Girl”; and Eli Ingle as Sam Silver, displaying everything you would want from a wimpy, loveable all-American business owner and who it is clear, especially in the quirky and beautifully arranged “Who I Am Kidding” is genuinely loved by his co-workers. Josh Holliday as rival nightclub owner Rico Castelli combined smooth charm with dark abusive and controlling tendencies that any woman would be wise to resist; whilst Jennifer Horsfield as Conchita Alvarez blended confidence, passion, exoticness and superb Latin dance moves, displayed at their fantastic best in “Havana/Caramba” that will leave you believing that Carmen Miranda has more chance of coming from South Yorkshire than Jennifer does. Both perfecting the Cuban accent, combined Josh and Jennifer capture the fierce chemistry of the passionate relationship between Rico and Conchita. In addition to the fantastic work of director Daniel Storey, musical director Steve Trotter and choreographers Sarah Masford and Anna Hollis, backstage I must praise Pete Miles for the set and props, with his use of a pure white set adding to the glamour of the show whist keeping the focus truly on talented cast; TD Lighting for the lighting, at its subtle, beautiful, moonlit best during the stunning “This Can’t Be Real”; Michael Moore and Molly Limpets in wardrobe and costumes, not just for the stylish and glamorous multiple costumes throughout but Stephen’s wonderful Batman dressing gown; and not forgetting the full band who provided the perfect music accompaniment throughout. 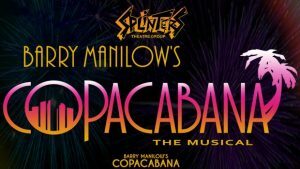 Proving that it does not deserve to be one of the lesser known musicals, Copacabana should not be missed by fans of great musicals in Sheffield and beyond. Copacabana will be performed at Montgomery Theatre, Sheffield from Wednesday 19th to Saturday 22nd September at 7.15pm, with an additional 2.15pm matinee on the Saturday. Tickets are £15. To book visit http://themontgomery.org.uk/TheMontgomery.dll/WhatsOn?FilmType=198748.